I am currently accepting portrait commissions. I’d love to create a memory for you of a loved one, an event, or an emotional time. See the gallery at the bottom of the post for some of my favorite portrait creations, then contact me at mockingbirdatmidnight_ at _gmail . 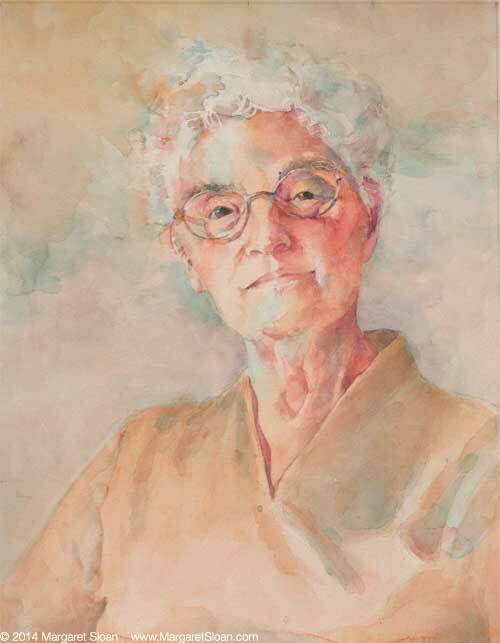 com to find out how you can commission a watercolor portrait. I love drawing portraits more than anything else. It’s odd that I would, as I’m not a gregarious person. As introverts go, I’m pretty high on the “I vant to be alone” scale. But that doesn’t mean I don’t yearn for human connections. It’s just that, rather than partying in a big, loud group, I prefer an intimate cuppa (plenty of milk and sugar, please!) with one or two close friends, sitting in the sun or in front of a cozy fire, trading tales, hearing their stories of their lives and loves. Painting a portrait is like sitting down with someone and having a nice chat, even if I’m working from a photograph. I often imagine I can hear them speaking to me. In fact, I often fancy the portrait as a conversation I’m having with the person, the paint, and the paper. My favorite portraits come from sitting down and letting the person talk. Their stories become part of the portrait, and help bring it to life, full of their spirit and soul. You can see that video here. It’s not long, and it’s very amusing. It’s the most wonderful feeling in the world when you manage to draw a portrait that captures not only the likeness of a person but something of their inner life as well. In the best of portraits there’s a synergy between artist and model that flows as easily as liquid, and creates something as beautiful and memorable as a life expressed in pigment, water, and paper. A hand painted portrait tells a story you can keep forever. Learn more about how you can commission a portrait of your loved one by emailing me at mockingbirdatmidnight [at] gmail [.] com. Thanks Sue. Looking forward to your class tomorrow! This is a very good blog. Full of humility and very honest. Beautiful portraits! Each person’s spirit come through in each work of art.